Every six months or so, Rob and Rebekah George type the name “Cesil George” into an internet search engine. Each time, the Bremerton, Wash., couple hope the search might render a clue leading to the whereabouts of Rob’s father. They hadn’t seen or heard from him in 23 years. 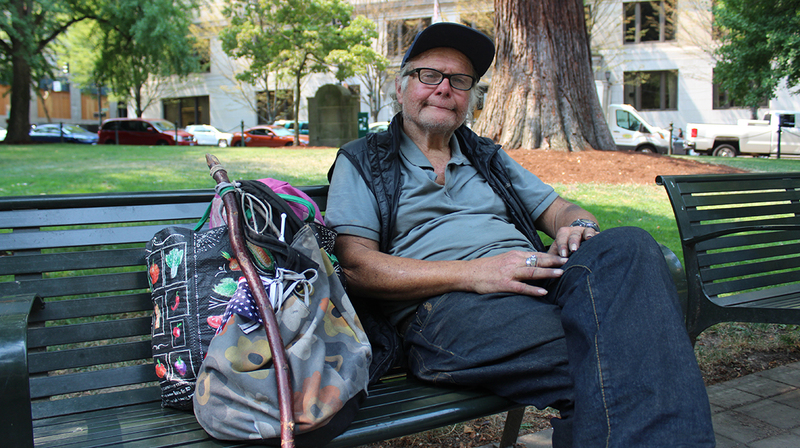 Rob assumed the search would eventually turn up a death record, but on March 6, the biannual search revealed his father was still alive – and that he was living homeless on the streets of Portland. Rebekah was first to find the Street Roots article, which had been published in September. 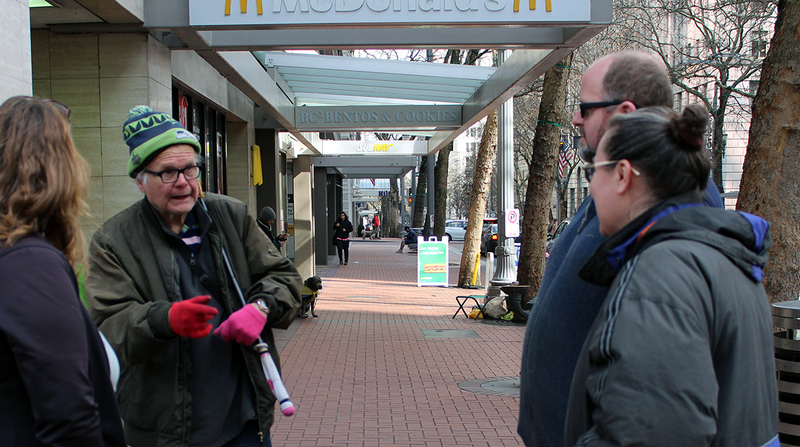 It was a story about how federal rules were making it difficult for some of Portland’s most vulnerable people to qualify for housing assistance, and Rob’s father was the case in point. As the article explained, Cesil George is a senior citizen, has mental health issues and has appeared to be going downhill this past year. While he looked older than Rob had remembered, Rob said he knew immediately that the man sitting on a park bench in the photograph that accompanied the article was his father. Cesil George sits on a bench in Lownsdale Square in front of the Multnomah County Courthouse. As a homeless senior with a mental disability, George is particularly vulnerable, but he still does not score high enough on a vulnerability assessment to qualify for permanent supportive housing. Rob never intended to become estranged from Cesil; it just sort of happened over the years. After Rob’s parents divorced in 1977, when he was 4, he continued to live with his father in the Woodburn area, where he was born. Cesil remarried two years later, and the two moved to Lake Oswego to live with Cesil’s new wife and two sons. Rob wasn’t happy with his new family, and Cesil’s marriage was rocky, but the two remained close. “He loved me, and he took the best care of me that he could,” Rob said. When Rob was 8, he went to stay with his mother and stepfather in Bremerton for the summer, but he never returned to Oregon. He learned later that Cesil had asked his mother if she could take custody of him. But Cesil drove up to spend the day with his son in Bremerton a couple times each year, and the two spoke on the phone every Saturday morning. Cesil also sent his son a $25-a-month allowance for as long as he could. It was when Rob was about 14 that his father started showing signs of mental illness and stopped holding down jobs. Rob remembers going to a 7-Eleven with his father in Portland one day. He poured a Slurpee and carried it up to register, and with his father standing beside him, he paid for it. As they drove away, Cesil asked him, “Why didn’t you pay for that?” Rob knew it was more than a simple slip of the mind. It was around that time that the visits and phone calls subsided. Throughout the remainder of Rob’s teenage years, he didn’t have much contact with his dad. The last time Cesil came to visit him was when he was a senior in high school, in 1991. Five years later, Rob married Rebekah, and after a honeymoon on the Oregon Coast, they decided to swing by his grandmother’s farmhouse in Gervais, just south of Woodburn. He wanted to introduce his new wife to his grandmother and father for the first time. Cesil had divorced the woman in Lake Oswego years earlier, had remarried and had divorced again. Now he was living in a trailer on his mother’s property. Rob remembers spending a few hours with his father and grandmother that day. He figured he’d be back to visit before too long, but life just didn’t work out that way. It ended up being the last time he ever saw his grandmother, who died a few years later, and the last time he would see his father for many years. Just a few months after the visit, Cesil was forced to leave his mother’s property following a menacing charge and a restraining order. Soon after, he was admitted to the Oregon State Hospital in Salem. Upon his discharge, Cesil stepped out of the psychiatric hospital and into the elements. He would be chronically homeless for decades. Around the same time Cesil’s homelessness began, Rob’s mother reached out to an old friend of Cesil’s in an effort to locate her ex-husband. She was told that Cesil stopped by the man’s home for a shower and meal and that he was living in a box under an overpass in Salem. Rob’s stepfather located the box, but Cesil was gone. That was the closest his family would come to finding him for years. He had no phone and no address and never made contact. The second clue came a few years ago, when a man who went to high school with Cesil phoned Rebekah. He was trying to track down every person in his graduating class. He told the couple he came across a court record in his search that placed Cesil in Portland in 2012; it was for fare evasion on a MAX train. Rob took comfort in knowing that his father was likely still alive, he said. Despite years of homelessness, Cesil always shied away from social services, living an existence entirely off the grid. The same lifestyle that made it difficult for Rob to find him was also why it was difficult to show evidence of his chronic homelessness in order to qualify for housing assistance. As soon as Rob confirmed the man in the Street Roots photograph was his father, Rebekah got to work, attempting to contact everyone mentioned in the article who might know where to find him. When she emailed Street Roots, we connected her with Tammie Jones, who has spent more than a year of her free time trying to help Cesil get a roof over his head. She came to know him because he was a fixture in the park in front of Multnomah County Justice Center where she works. Within a week, a reunion had been arranged. They would see Cesil for the first time in 23 years at 11 a.m. Saturday, March 16. But Rob had questions: Would his father remember him? If he did, would he even recognize him? He had doubled in age, lost hair in some places and added it in others. “I didn’t know if I’d ever see him again,” Rob told Street Roots over the phone the day before he and Rebekah drove down to Portland from Bremerton. They wanted to keep an open mind about their first meeting with Cesil, free of any expectations, Rob said. Jones had arranged the meetup. They would reunite at one of Cesil’s favorite places to eat – the McDonald’s on Southwest Sixth Avenue and Main Street, downtown. When Street Roots arrived the morning of the reunion, Rebekah and Rob were standing with Jones on the corner in front of the fast-food restaurant. The Georges had lots of questions for Jones. They talked excitedly as the clock ticked closer to 11 a.m. Everyone was anxious, wondering if Cesil would remember to be there. Since January, thanks to vouchers Jones helped him acquire from Northwest Pilot Project, Cesil has been staying in a motel. Jones posted a note on the door to his room and asked the front desk to remind him to come to McDonald’s when he left that morning. About five minutes past the hour, Rob spotted Cesil across the street as he made his way toward us. Today he was wearing bright red shoes and a mismatched pair of red and pink gloves. Jones explained to Cesil that Rob was his son. Cesil acknowledged the situation and smiled. He’s a man of few words – always has been, Rob said. Taking the lead, Rob pulled out his smartphone and proceeded to show Cesil photographs – first of father and son together many years ago and then of his children. “You’re a grandfather seven times over,” he told Cesil, which garnered a smile. Rob and Rebekah’s children range in age from 15 to 2. Cesil George, second from left, meets with Tammie Jones, far left, who has been trying to help Cesil get a roof over his head. To the right are Cesil's son Rob and his daughter-in-law Rebekah, who have been hoping to reunite with Cesil after 23 years apart. Next time, Rob might try asking Cesil if he would like to join him for a meal instead of offering to buy it for him, his wife suggested to him. In the meantime, Rebekah is encouraging another meetup. Jones has continued her efforts to house Cesil since we first reported on his situation. She’s working with Northwest Pilot Project, which helps seniors obtain subsidized housing. She’s hopeful about a potential apartment the nonprofit recently found, as long as Cesil remembers to keep his appointments. She told Rob and Rebekah that she’ll have a cellphone for Cesil soon, and they can call him, although Rob is doubtful his aging father will be able to figure out how to use it. He said he will likely connect with his father again.